Police Officer Maurice Handloff was shot and killed shortly after midnight while attempting to arrest a robbery suspect who was holding up a civilian in their vehicle at a stop light on the 59th Street Bridge near Lancaster Avenue. Officer Handloff and his partner had been dispatched to the area to search for three suspicious individuals. Once in the area, Officer Handloff and his partner were then alerted by a civilian that a hold up was in progress on the bridge. As they arrived on scene Officer Handloff`s partner, who was driving, managed to grab the holdup subject's left arm while Officer Handloff attempted to grab the other arm. The suspect fired his handgun through the pocket of his coat, striking Officer Handloff in his groin. He was rushed to Misericordia Hospital where he died shortly after midnight. The suspect, who had been on parole at the time of the incident for embezzlement, was arrested at the scene. In November 1937 he was found guilty by a jury in 12 minutes of first-degree murder. He was sentenced to death on March 28th, 1938, in the electric chair. 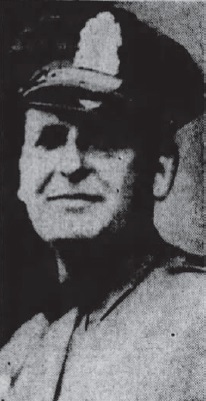 Police Officer Handloff served with the Philadelphia Police Department for 12 years. He was survived by his brother. Rest in peace and Olav Hashalom Officer Handloff. I'm humbled to leave the first reflection for your heroism on behalf of the City of Brotherly Love.